One way to be Franciscan is to recognize the gift of being Christ’s healing presence to one another. Lord, make me an instrument of your peace. It started off as a typical day at St. John’s Hospital (Springfield). Sister Dolorine Czok was going about her work as a Pastoral Associate when a nurse asked her to visit a certain patient. “When I walked into the room, I noticed out of the corner of my eye that the crucifix was covered with a towel. I asked God for help,” Sister Dolorine said. She talked with the patient about the care, and overall, he was satisfied. When it came time to leave, she found the courage to ask, “What’s this?” (as she pointed to the covered crucifix) The patient responded, “Oh Sister, please, please, please,” and gestured to remove the towel. She obliged and quietly left the room. “I gave thanks to God and prayed that somehow he would know the love of God.” When she returned the next day to visit him, he had been discharged. Where there is doubt, let me bring faith. A few years later, while at St. Mary’s Hospital (Decatur), Sister Dolorine was visiting with a patient whom she thought asked “Do you sin?” To which she responded with a chuckle, “Of course I sin.” The patient realized that the question was misinterpreted and restated “Do you sing?” “Oh, yes, I sing,” replied Sister Dolorine. “Do you have a favorite song?” The patient replied, “How Great Thou Art.” Grateful that it was a familiar hymn, she sang verses 1 and 4 including the phrase “…and take me home, what joy shall fill my heart.” A few minutes later, the nurse paged her to return to the room because the patient was dying. Where there is sadness, let me bring joy. Agnes Czok was born in Kempa, Silesia, Germany, on April 17, 1914 – the daughter of Franz and Maria (Schymassek) Czok. As a teenager, she worked in a clothing store in Oppeln, Silesia, Germany and often talked about religious life with her coworker Gertrud Miosga (Sister Angelista). The young girls knew of the Hospital Sisters of St. Francis because of the Sisters’ hospital in Oppeln (St. Adalbert Hospital). In 1931, Gertrud entered the Community and volunteered to be a missionary in America with the Hospital Sisters in Springfield, IL. Unfortunately, Agnes’ parents said that she was too young to join, but when she asked their permission two years later, they agreed. “Four other candidates and I volunteered to be missionaries in America, and we boarded the ship Europa in 1933. Seven days later we arrived, and despite being sea sick most of the trip, we were very excited,” Sister Dolorine recalled. Following graduation from St. John’s Hospital School of Nursing in 1940, Sister Dolorine continued her nursing education with post graduate studies in surgery at St. John’s. For nearly 35 years, she served in surgery, and she was involved in the early stages of the cardiac surgery program at St. John’s. When it was time in her professional life to be a volunteer, she was back in the surgery department and waiting areas. 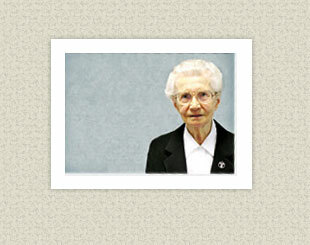 Her service in Pastoral Care reaffirmed her role as God’s hands and hearts to those in need. For it is in giving that we receive.